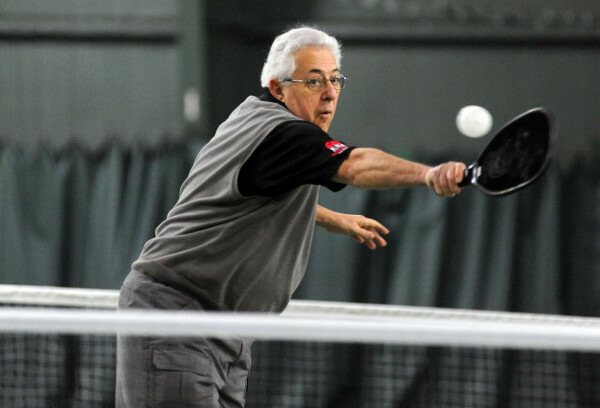 Tony Cerbone, 70, plays pickleball with his wife and friends on Feb. 4 at the Armstrong Tennis Center in Hampden. 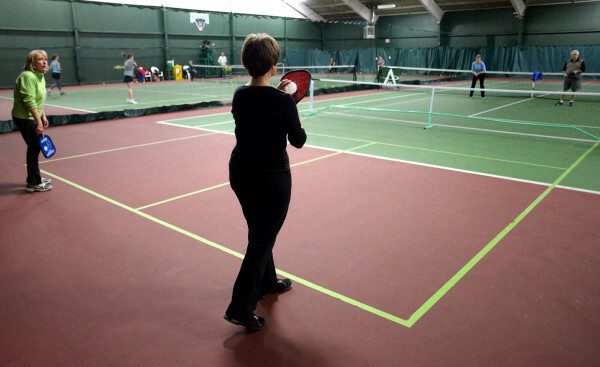 Dottie Cerbone (right) gets ready to serve as her teammate Sue Bartley (left) looks on during a game of pickleball on Feb. 4 at the Armstrong Tennis Center in Hampden. Their opponents were Dottie's husband, Tony Cerbone, and Betty Jamison. BELFAST, Maine — The improbably named sport of pickleball is quickly catching on in Belfast, where a couple of dozen people per day picked up a racket at a temporary court at Belfast City Park last summer and played a game. However, several city councilors are wondering whether the sport’s newfound popularity in the city — particularly with its older residents — is enough of a reason to convert one of the municipality’s two basketball courts into four dedicated pickleball courts. Belfast Parks and Recreation Director Norm Poirier estimated that converting the dilapidated basketball court would cost more than $24,000. That money would be used to resurface the court and install permanent nets and a chain-link fence so balls wouldn’t travel between the basketball and pickleball games, Poirier said. Belfast pickleball enthusiasts are hoping a national pickleball association or other funding source will fund about 60 percent of the conversion costs. Pickleball is a game played with either two or four people that combines some aspects of tennis, ping-pong and badminton on a hard-surfaced court that is 20 feet by 44 feet. Players hit wiffle balls with paddles a little bit bigger than a ping-pong paddle back and forth across the net. According to the USA Pickleball Association, about 70 percent of players are 60 and over. Councilor Mike Hurley raised the concern at the Dec. 15 regular City Council meeting that if one basketball court is converted for pickleball, there will only be one public outdoor court left in the city. Poirier said the city recently spent about $10,000 to rehabilitate one of the basketball courts. Councilor Neal Harkness raised another worry. According to the 2010 U.S. Census, Belfast has an older population than the state as a whole. Nearly 22 percent of the city’s residents were 65 and older in 2010, compared with 15.9 percent of Mainers. Poirier said he is planning to reach out to officials from Belfast-based Regional School Unit 71 to see whether there is any interest in building another basketball court as a cooperative project between the school and the city. He expects to return to the council by March with a revised proposal. Nina and David Halbert, two of Belfast’s pickleball players, said they would love to see a dedicated court in the city.